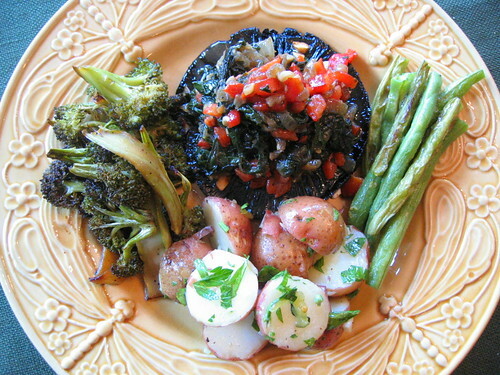 The mushrooms were especially nice, and grilled up perfectly -- matched with the wilted chard and roasted red bell peppers it made for a killer combo. The potato salad was a spur-of-the-moment thing when we found the bag of little red potatoes hiding at the bottom of the bin, bought a few weeks back. A simple vinaigrette emulsion with the addition of dijon mustard, herbs and the homemade pickles elevated it to classic status. 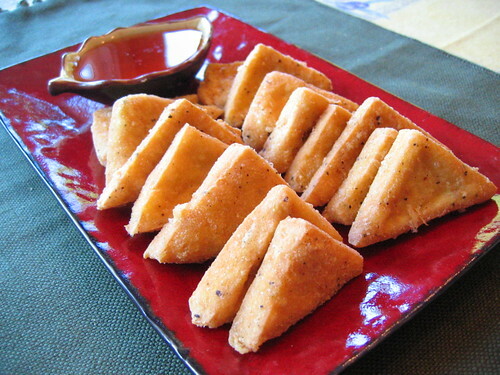 The tofu triangles are coated with a combo of 1 tbs. tamari, 1 tbs. cornstarch, 1 tbs. gin and pepper. They are left to marinate in the fridge for an hour or so -- then they're deep-fried at 375F until crispy on the outside -- about 3-4 minutes. The dipping sauce is rice wine vinegar, sugar and tamari. The eggplant and chickpea stew come from the new issue of Vegetarian Times and is a slow braise full of tomato and eggplant. 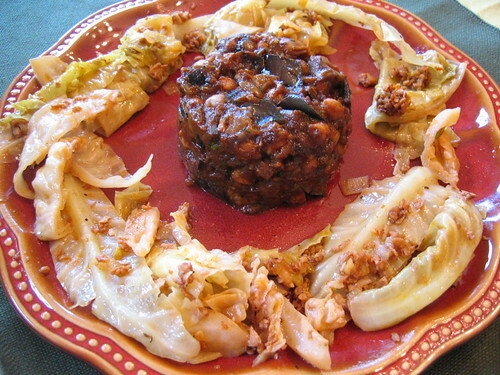 The cabbage dish works well with the bold flavors of the homemade soyrizo. A great combo pairing. First up, Catherine of Albion Cooks grills us on the zen of plating, and the genesis of Raw Food Wednesday. 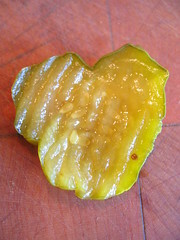 ...and because I have no place to use this picture -- a heart-shaped pickle from our recent batch made from another "Farmer's Market Score!" 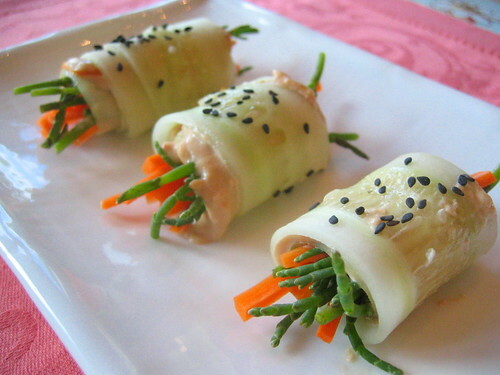 of cucumbers. Crunchy! Farmer's Market Score! 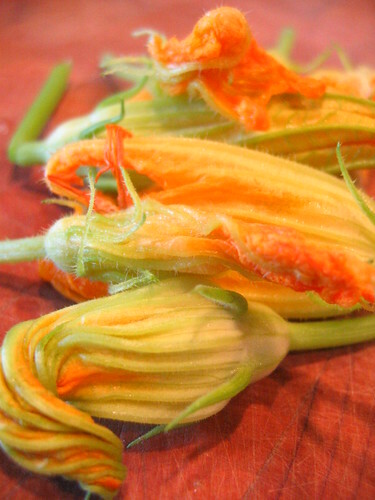 A whole case of squash blossoms for a relatively inexpensive price. Now the quandary, what to do with them in the next 36 hours? First up, our standby of stuffing them -- this time with a slightly different filling, including roasted corn. It was so incredible that it may become a permanent fixture. As for tomorrow? hmmm... we'll see. A little experiment involving tofu strips marinated with tamari and pepper, rolled in flour seasoned with smoked paprika, a cornstarch slurry, and finally breadcrumbs with a little nutritional yeast. 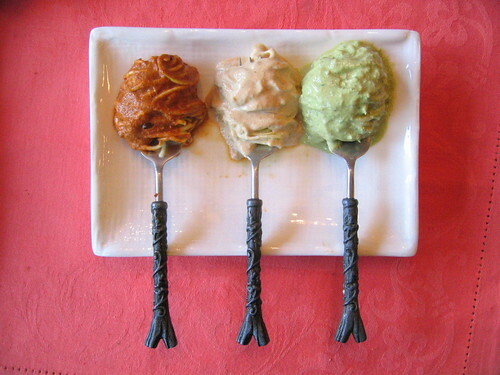 Served with a vegenaise and smoked pepper dipping sauce. Liz made a couple of ciabatta loaves, so we made a quick bruschetta, trying however in vain, of using up some of the basil from the garden. 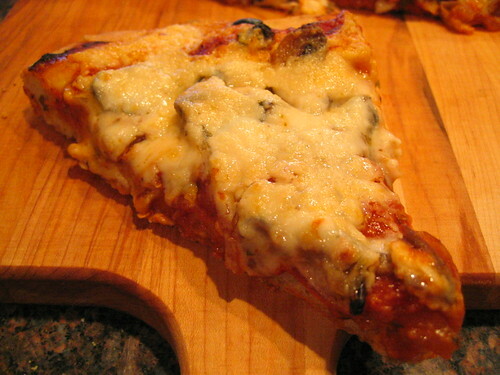 We saw "The Simpsons" movie today, so it only seemed fitting to have mmmm... pizza. Liz made the dough earlier in the day and made a free-form crust. It was par-baked for 10 minutes, loaded up with the toppings (including an awesome hickory smoked tofu), and baked for another 10-12 minutes until the FYH (Captain) Monterey Jack* melted. 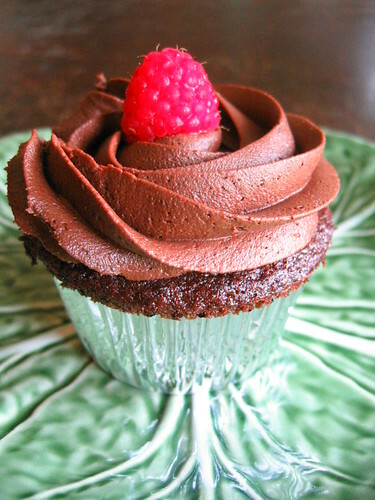 For dessert we should have made doughnuts, but chocolate cupcakes from "Vegan Cupcakes Take Over The World" will have to do... and dig the new pastry tip! oooh! ahhh! * Brrring! Brrrring! Hello Cheese? No - Cheese can't dial a phone! The green beans came from the farmer's market last Saturday and were just about the nicest ones we've ever seen -- thick, flavorful and not tough or stringy... juuust right. 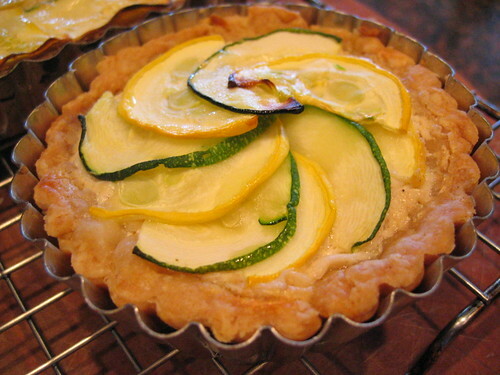 On a pie plate (or shallow dish), add 1/2 tsp. salt and 1/2 tsp. pepper to the all-purpose flour and stir to combine. In a shallow bowl add 1 tbs. 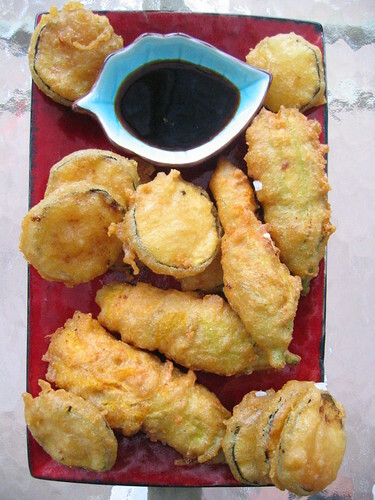 of tamari, and dip each piece of tofu, coating both sides. 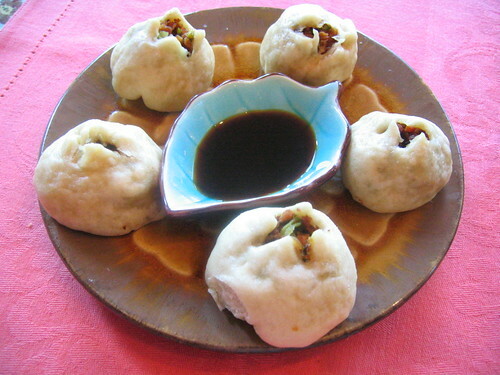 Then dip each piece of tofu in the flour, and turn to coat completely, shaking off any excess. In a large pan (big enough to fit all eight cutlets) over med-high heat, add 1 tbs. of the canola oil, and swirl to coat the pan. Gently add the flour-coated tofu pieces. Cook until the tofu just starts to brown in spots, about 4-5 minutes per side. Remove the tofu from the pan, and put into a very low oven to keep warm. Add the remaining 1 tbs. of canola oil to the pan and add the sliced mushrooms. Add a pinch of salt to release the liquid in the mushrooms, and stir until they brown, about 8 minutes. Reduce the heat to medium, add the garlic and tomato paste, stir for 1 minute. Off heat, add the marsala. Return the pan to the stove, and scrape up any browned bits sticking to the bottom of the pan. 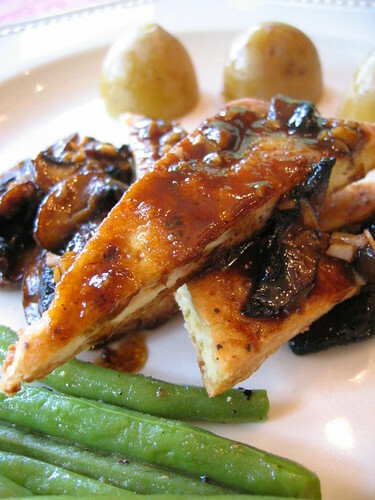 Bring the marsala up to a simmer, and reduce by half, about 5-7 minutes. Off heat, add the lemon juice and stir to combine. Return the pan to the stove and whisk in 1 tbs. of soy margarine. Check for salt and pepper. Pour the sauce over the tofu and serve over pasta. 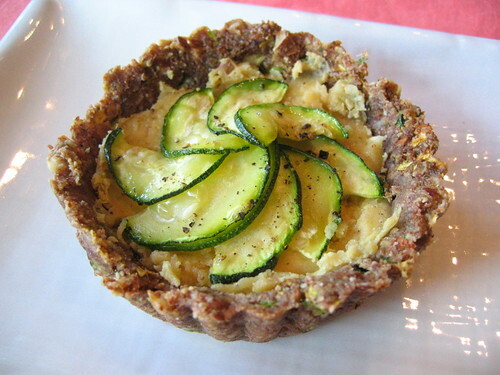 Then the filling is added -- a shallow layer of cashew cheese with a little shallot, nutmeg, pepper and white miso, and finally topped with zucchini brushed with olive oil, salt and pepper. Then the whole thing is dehydrated for another 4 hours. When using this many different types of nuts, you want to find a balance so that the meal isn't too heavy -- especially in summer. 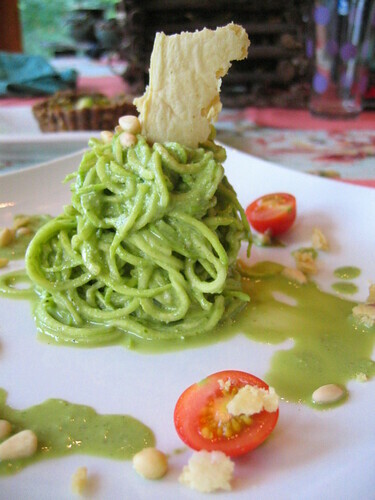 The pesto is simply basil, pine nuts, garlic, salt, pepper and olive oil in the vita-mix. It's poured over the spiral-cut zucchini noodles and served with a couple of cherry tomatoes from the garden and a bit of dehydrated cashew cheese. 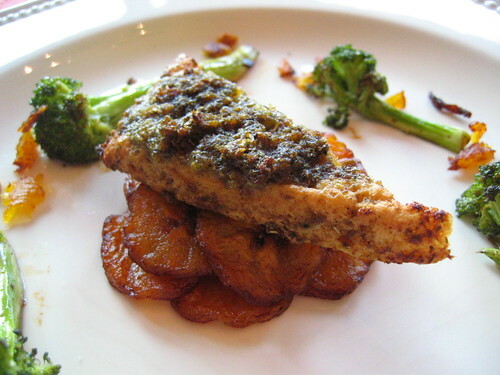 The tarragon sauce involves making a reduction of stock/wine/demi-glace/tomato sauce/tarragon which makes for a very thick flavorful sauce which coats the tofu quite well. 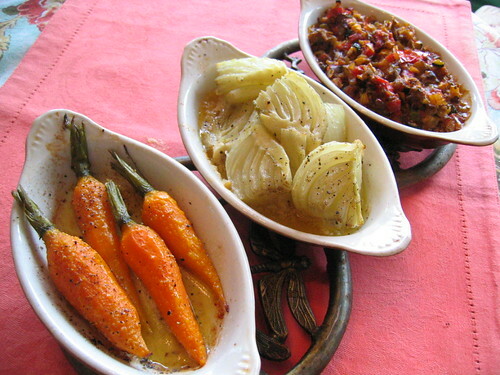 The tian (a type of earthenware gratin dish which gives it's name to this dish) is basically a proto-ratatouille and matched well with the tofu and tarragon sauce -- olive oil, onion, garlic, eggplant, zucchini, tomato, wine, salt and pepper. Awards? Awards? We don't need no stinking awards! Add 1 tsp. salt to the diced eggplant in a colander, toss to coat and let drain for 30 minutes. Rinse eggplant and pat dry with paper towels. Put the eggplant in a small bowl and add lemon juice while you're prepping the rest of the veggies. 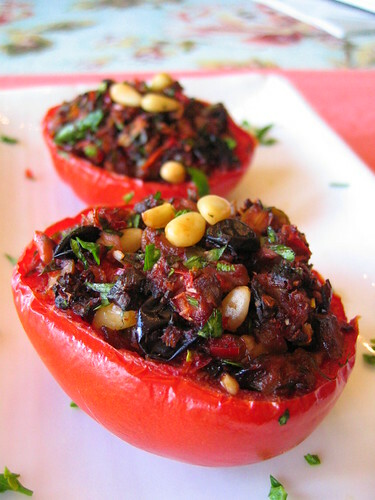 Scoop out the tomato flesh from the tomato half and add to a large bowl with the celery, sun-dried tomato, red bell pepper, currants, pine nuts, green olives, basil, parsley, olive oil, lemon juice (or apple cider vinegar), nama shoyu, basil, parsley and black pepper. Drain the eggplant, add to the mixture and stir to combine. Check for seasoning. Stuff the tomato halves with the eggplant mixture and dehydrate for 6-8 hours at 105F. The couscous couldn't be any easier -- mint, parsley, cilantro, olives, lemon juice, olive oil, salt and pepper mixed into cauliflower that was pulsed in the vita-mix. Served tonight over some local romaine that we picked up at the Kent Farmer's Market. The borscht may not be the prettiest dish to look at, but it certainly tastes great, and is a house favorite. 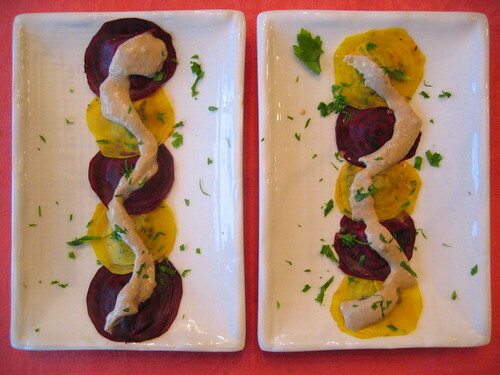 The beet/orange juice combo is mixed with avocado, jalapeno, dill, cabbage, apple, olive oil, salt and pepper. The Napoleon was a last minute idea, so next time we might dehydrate the apple slightly to firm them up, but having said that -- it worked out rather nicely. 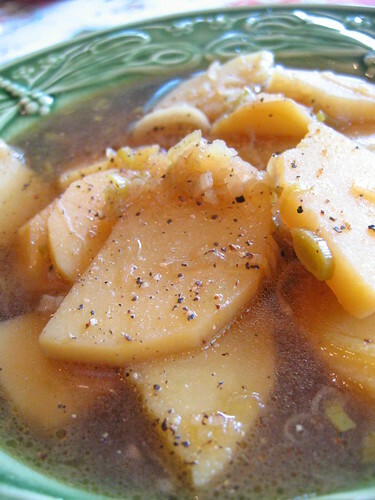 The apples were dipped in a mixture of lemon juice, a wee bit of agave and the tiniest pinch of cayenne. The chard was tossed with olive oil, nama shoyu, black pepper and thinly sliced shallots and dehydrated for 1 hour at 105F to wilt slightly (this helped when it came time to stack). The fennel salad was simply tossed with olive oil, lemon juice, salt and pepper and allowed to marinated for 15 minutes before serving. 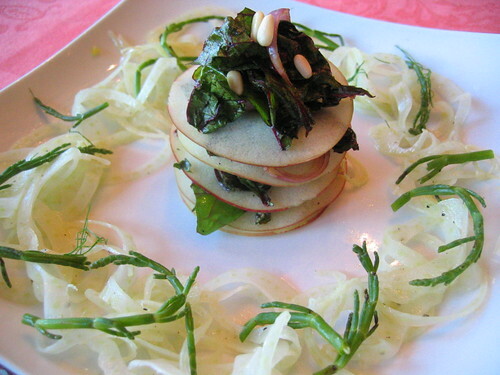 The sea beans were trimmed and added at the last moment to preserve their salty crunch. 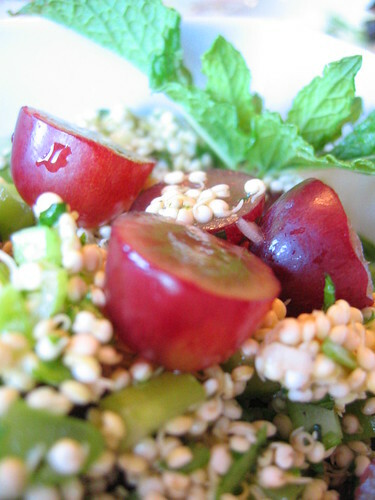 The quinoa and grape dish is adapted from "Raw Food Real World", and is sprouted quinoa, grapes, celery, lime juice, cilantro, basil, mint, parsley, scallion, olive oil, apple cider vinegar, salt and pepper. Strip the corn off the cob and put in a medium bowl along with the olive oil, lemongrass and shallot. Using a mortar and pestle (or a blender), add the garlic, lime zest, nama shoyu, serrano, lime juice and cilantro and mash up until it gets pulpy. Add to the corn mixture and toss to incorporate. 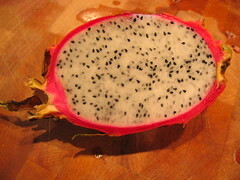 Grind the dry ingredients, juice the wet ingredients and combine. Check for seasoning. 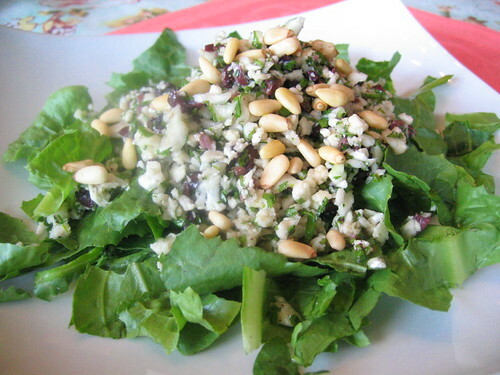 The Sunflower Seed Salad is adapted from RAWvolution -- soaked sunflower seeds pureed,with diced celery, shallots, and minced dill, thyme, oregano, parsley. The dressing was garlic, thai coconut water, pine nuts, lemon juice, sea salt, mustard seed dressing on a bed of shredded romaine lettuce. 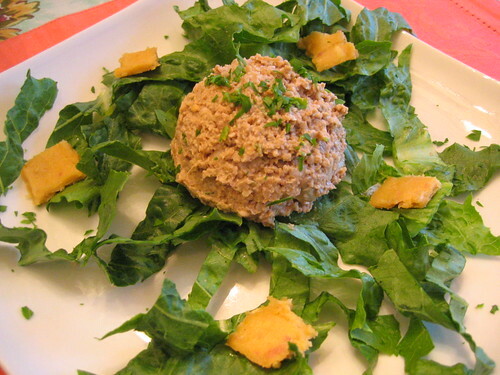 We're doing raw all this week, so expect to see some favorites (along with some new dishes). 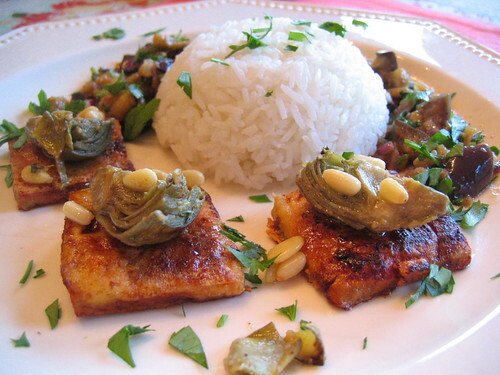 Here's a familiar dish, with a slight, er... twist. 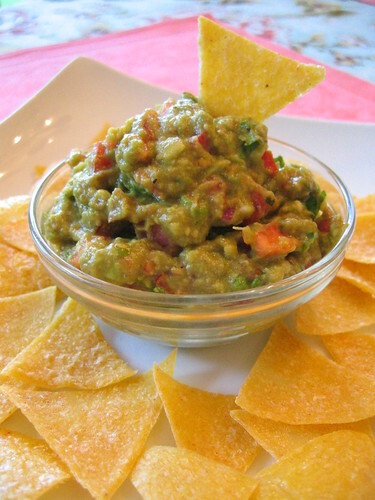 Put all the ingredients (except the olive oil) into the vita-mix and puree. 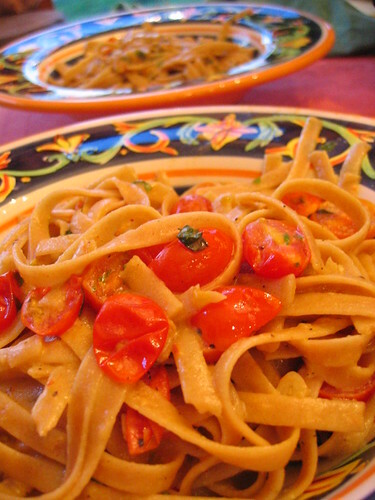 Slowly drizzle enough olive oil (depends on how juicy the tomatoes are) until creamy. Check for seasoning, and it should be pretty spicy. For assembly: Place the arrabiata sauce in a small bowl. 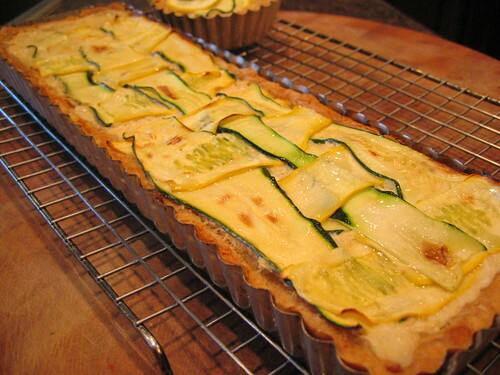 Spiral cut the zucchini into long strands. Twirl the pasta around with a small fork, and dip into the sauce. Turn the fork to coat with the sauce -- it's best to turn it along the edge of the bowl as this helps pull extra sauce off. Part one: In a pressure cooker* over med-high heat, place 1 tbs. olive oil and the clove-studded onion and saute until the onion starts to show some color. Add the rinsed French lentils, and enough veg stock to cover the lentils by 1 inch. Attach the pressure cooker lid and bring it to the first ring (or equivalent 6-8 psi) and maintain for 16-18 minutes. 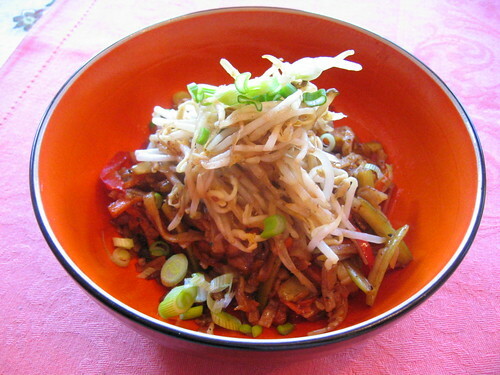 Part two: In a wok on med-high, stir-fry the cubed seitan in 1 tbs. olive oil and remove when browned. Add some additional olive oil, the sliced onion, garlic and carrot and 1 tsp. of salt and stir-fry until golden (about 5 minutes). Add back the reserved seitan along with herbes de provence and some fresh black pepper. 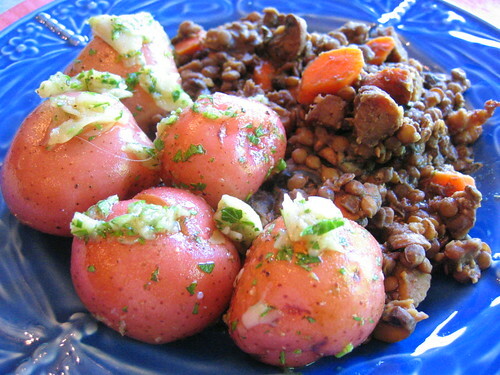 Part three: After the lentils have finished cooking, remove the onion piece and discard. Add the lentils to the seitan mixture and stir to combine. Check for seasoning and serve hot. 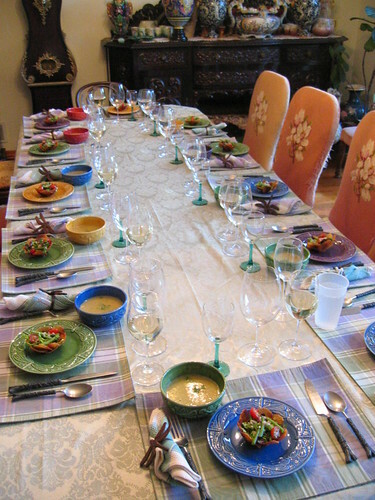 thanks to the PPK crew -- Tami and Jim, Maureen and David, Liz and Chuck, Anna and Phil for finding the house -- and it's always a special night when we can cook for fellow vegans. We had a great time! 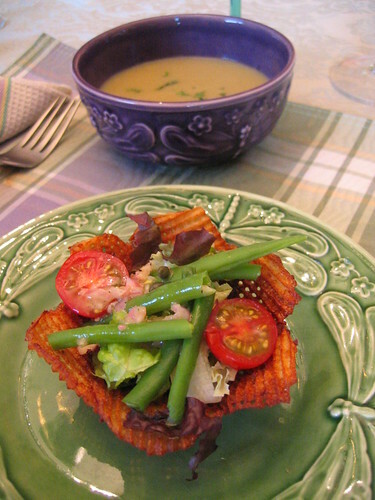 The gaufrette potato bowls are something we've done in the past -- it's time consuming to be sure -- but it works exceptionally well for a Salad Nicoise (lettuce, green beans, sun-dried tomato (for the anchovies), capers, kalamata olives, cherry tomatoes, parsley and the gaufrette potato basket instead of the boiled red potatoes). 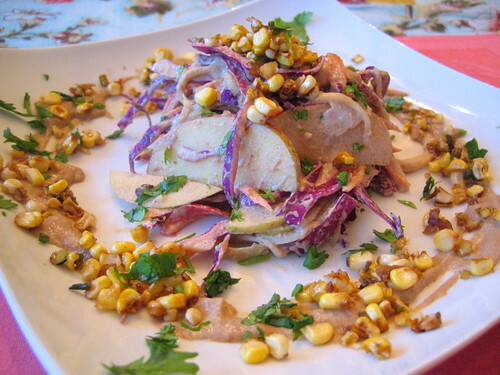 The dressing was the traditional vinaigrette of shallot, dijon mustard, salt, lemon juice, vinegar, olive oil, and pepper. 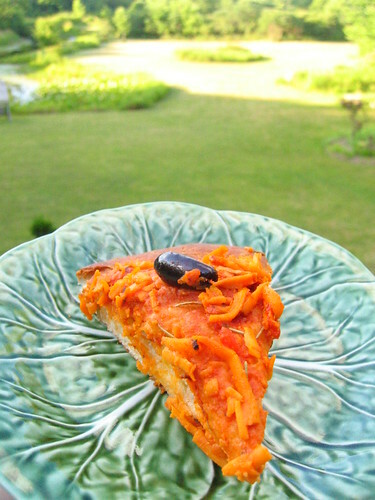 The miso added to the soy cream cheese filling was a nice twist -- it only added to the creamy goodness. 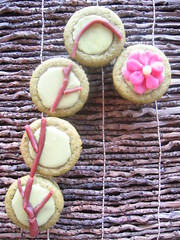 The concept/execution of the cucumber tea sandwiches was shamelessly adapted from Lolo's excellent blog. 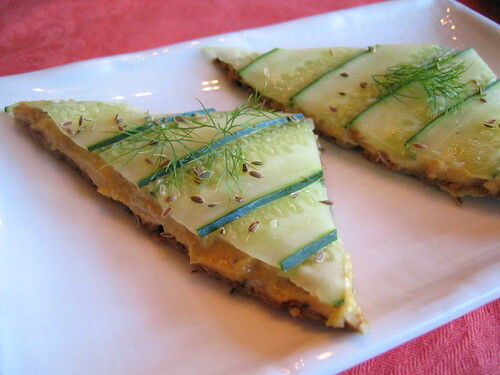 We used Ani Phyo's "Black Sesame and Sunflower Bread" as the base; a quick cashew cheese spread (cashews, lemon juice, salt, pepper, water, garlic); cut the cucumber on the benriner; garnished with a pinch of sea salt, some dill fronds and dill seeds. Very tasty! The salad dressing used the leftover cucumber and dill as a base with cashews, olive oil, lemon juice, garlic and sea salt. The baby artichokes were trimmed -- by the way, when you think you've trimmed them enough, go ahead and peel one extra layer off, your teeth will thank you later -- and were then blanched, and finally sauteed with olive oil, lemon juice, salt, pepper, a bit of nooch (a.k.a. nutritional yeast) and a pinch of red pepper flake. 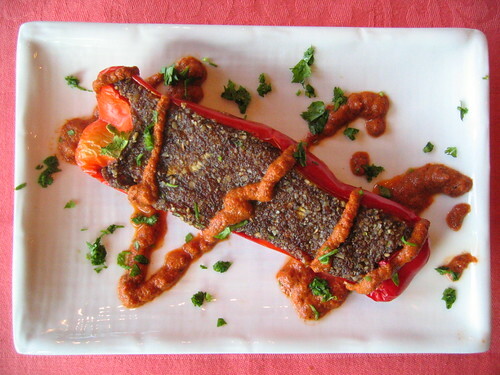 The eggplant dish is from Jamie Oliver -- steaming is a different way of preparing it, but it makes the eggplant very "light" without using olive oil. Steam the eggplant chunks for 10 minutes, mix with the dressing -- sesame oil, thai pepper, hot sauce, soy sauce, lemon juice, scallion, celery leaf, basil, mint, salt and pepper. The jerk is apple cider vinegar, olive oil, nutmeg, allspice, cayenne, thyme, cilantro, garlic, salt, pepper and sugar all thrown in the Vita-Mix and turned into a spreadable sauce. 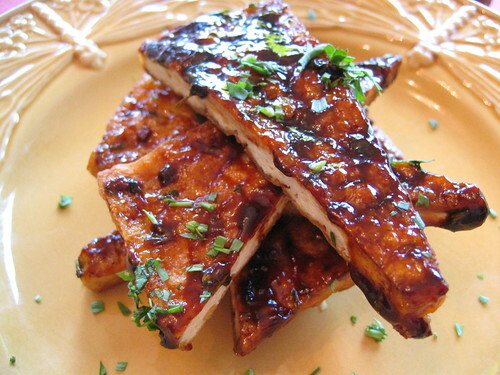 The tofu was lightly pan-fried with a little splash of tamari at the end of cooking. Then it was cut into triangles, coated with the sauce and roasted in the oven at 450°F for 10 minutes until it came out crusty and delicious. 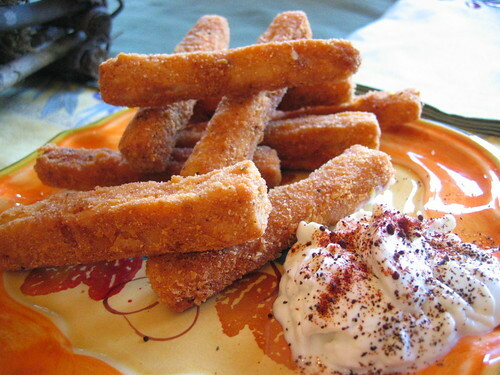 The (slightly ripe) plantains were cut into rounds and deep-fried until caramelized, then sprinkled with salt. 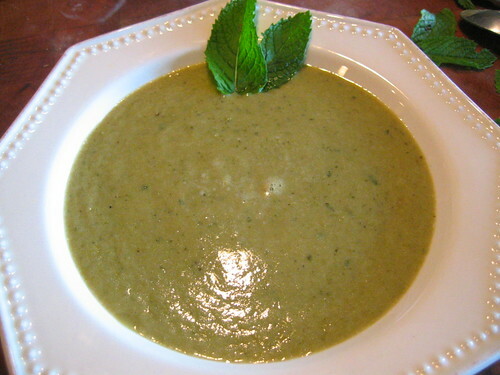 When the temp hits 90°+, it's time to break out the cold soups -- and the classic English Pea and Mint soup fit the bill perfectly... very refreshing. The basic recipe is to sweat diced onions and garlic in soy margarine, add a bit salt and pepper, then a tablespoon or so of flour. Meanwhile poach about a 1/2 lb. of English peas in 3 cups of veg stock. Add the peas, stock along with 3 tbs. of finely chopped mint and 1/4 head of Romaine or Boston lettuce to the onion mixture and bring to a gentle boil, then simmer for 10 minutes. Puree the whole thing, let it come to room temp (or put it in a container and rapidly cool in an ice bath) and refrigerate for at least an hour, but longer is better. Two things we have an abundance of this year are Mint and Basil. 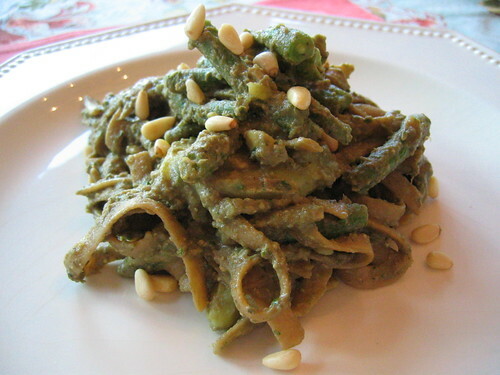 Plus there was a large container of fettuccine from last night, so we dipped into the "things to do with leftovers" file again and made this pesto based dish from Jamie Oliver that combines potatoes, green beans, fettuccine and pesto (basil, garlic, salt, pine nuts and olive oil). It's all done in one large pot which also cuts down on the clean-up. Add a little garlic, red pepper flake, nutritional yeast and a pinch of salt to the drained pasta with some olive oil and you have a simple, but tasty meal. a.k.a. 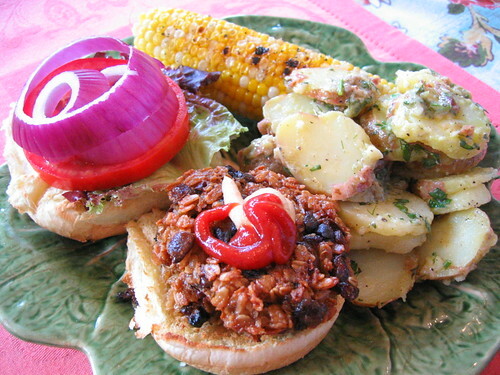 "what to do with leftovers"
Most of the time, leftovers are used for lunch the next day. Today, we were up in Cleveland (getting "things" ready for Bastille Day), there was a big stash of the Arroz con Gandules leftover. 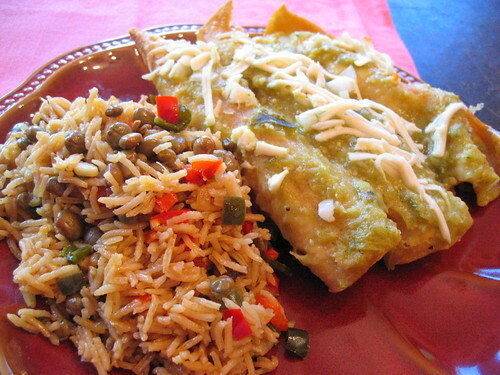 There's something about tomatillos that we really love -- the almost citrus-like tartness and the high levels of natural pectin make it perfect for sauces, like this one for the enchiladas. 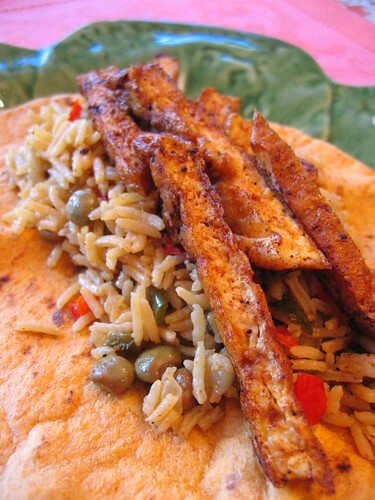 The smoked tofu (with some additional smoked paprika) was a perfect foil for the tomatillo. The arroz con gandules (a.k.a. Pigeon Pea Rice) starts with some achiote oil (annato seeds steeped in canola oil for 10 minutes) which renders the rice a lovely orange hue. 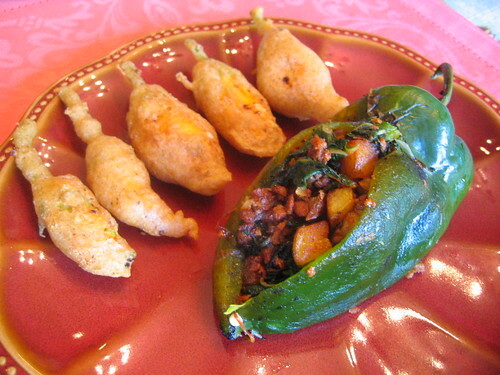 The spice from the poblano and cayenne makes it a meal unto itself. The Pad Thai sauce was tamarind, fermented black bean, tamari, sesame oil, palm sugar and sriracha -- a nice balance of sweet, sour, salt and heat. 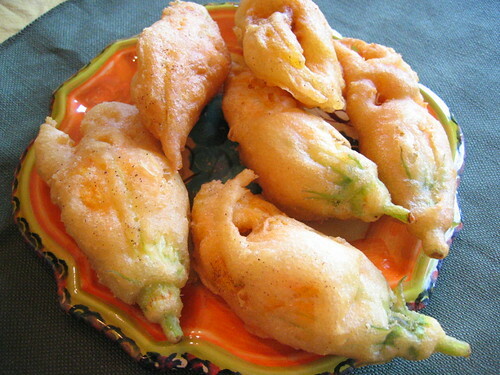 This is one of our favorite times of the year -- squash blossoms fresh from the garden. Then stuffing them with cream cheese and smoked paprika and deep-frying them. They just melt in your mouth... so, so good. 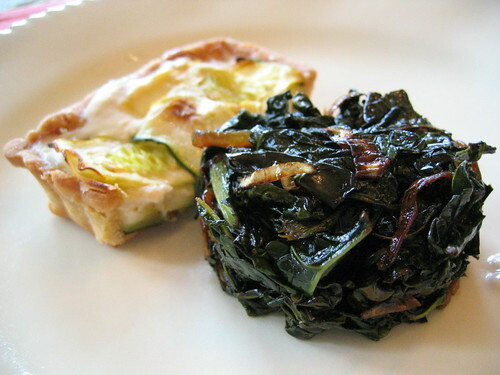 The rellenos benefited from chard which was from the same stand where we picked up the Indian mustard greens last time (which went into the gumbo z'herbes). A simple vegan blog about what we eat everyday. This blog came together because once people know we're vegan, the first question we get asked is...What The Hell Does A Vegan Eat Anyway? 1. When an ingredient is listed like [this], it means [this] was the original ingredient in the recipe. 99% of the recipes get adapted in one form or another. 2. When Tofu is referred to, it usually means extra firm tofu, If the (softer) tofu in the aseptic box is used, it'll be noted. Boxed tofu mostly gets used in cream sauces. Assume that we're talking about Rice Milk, Vegan Cheese and non bone-char sugar. 4. We don't like ersatz food (i.e. tofu molded into the shape of a turkey for Thanksgiving), but we're funny that way. 5. A brief personal history. We were vegetarian for 7 years, and have been vegan for the last 20 years. If you have the time, check out the music page.